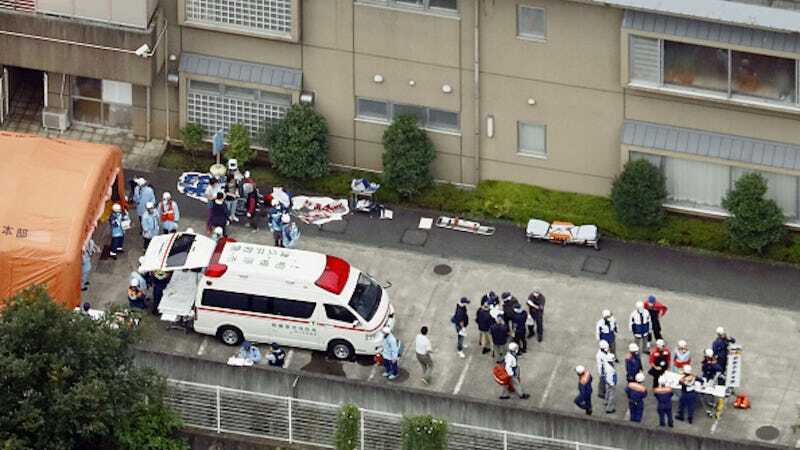 Early Tuesday morning, a man attacked residents of the Tsukui Yamayuri-En disability facility in Sagamihara, Kanagawa Prefecture, Japan, killing at least 19 and wounding approximately 25. According to CNBC, facility staff called the police around 2:30 a.m. local time, alerting them that a man wielding a knife was on the property. After that same man’s attack, 19 people were described as “in a state of cardiac arrest.” Japanese officials often use this terminology before the official declaration of death. Currently, family members of facility patients are struggling to obtain information. A man who referred to himself as the father of one patient came to the center upon hearing the news on the radio. He remains uncertain of his child’s well-being. Tsukui Yamayuri-En has issued no statement regarding the status of their patients at this time. “I’m very worried, but they won’t let me in,” the man told reporters. In Japan, these sorts of attacks are rare. The last documented mass killing occurred in 2001, when a janitor returned to the school where he had been previously employed and stabbed eight children to death.